It was once said by legendary French restauranteur Fernand Point that "great cooking is merely a series of simple operations, but that each stage must be completed successfully." (Calvel, Wirtz & MacGuire, 2001) This captures the heart of bread making. In order to deepen our understanding of the stages of bread making, so as to improve the quality of our finished loaves, it is important to examine bread making from a scientific perspective. This website is concerned with the making of bread using four main ingredients; flour, salt, leavening and water. These ingredients have been used for centuries and, in their beautiful simplicity, with variances of unlimited potential, make superior quality loaves of bread. The information found on this website comes from personal experience, augmented by a few major works I have on my bookshelves including "The Taste of Bread" by Raymond Calvel. I first discovered Calvel's book five years ago, when my ruddy Dutch bakery employer handed me a copy of "The Taste of Bread" with the hope that I might find something useful in it. What I found was a man who stood up for proper qualities of real bread and scoffed at what he called the "bastardized" white pan loaves typical of North America. His mission was to convert the masses away from the over-mixed, tasteless, fluffy white stuff baked in pans and back to the flavorful and aromatic hearth breads with creamy colored crumb and thin golden crust typical of Parisian bakeries. Calvel used the principles of science to make an infallible case for the desirous qualities of traditional baking. He invented what is known as autolyse, a process by which flour and water are mixed briefly and are allowed to rest, ultimately reducing the mechanical mix time and subsequently the degradation of the dough by oxidization. The way he spoke about bread, his passion for traditional bread making and the implications of his scientific discoveries set the world ablaze in pursuit of artisan breads. 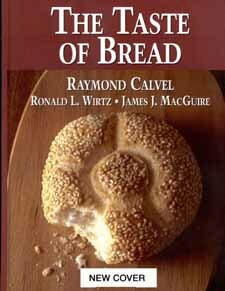 After reading "The Taste of Bread", I found that every other bread book written that was worth anything had reference to Raymond Calvel. In the spirit of Raymond Calvel, let us discover real bread again and improve our understanding of the bread making process through science.